Three days later came the Father’s answer to the Problem of Death. It was equally extravagant. For Jesus was not simply brought back to life like Lazarus. That would be resuscitation, the return to normal, human life, with all its limitations. Including death. Yes Lazarus ultimately had to go through it all again . . . the dying, the grieving family, the burial. Jesus did not “come back.” He passed over, passed through. 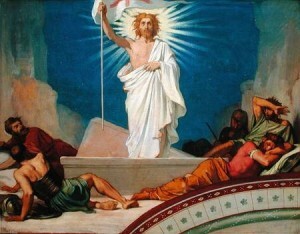 His resurrection meant that he would no longer be subject to death. Death, as St. Paul said, would have no more power over him. You may say that physical death was not the worst consequence of sin, and you’d be right. Separation from God, spiritual death, is much more fearsome. But enough with the talk that physical death is beautiful and natural. It is not. Our bodies are not motor vehicles driven around by our souls. We do not junk them when they wear out and buy another one (that’s one problem with the reincarnation idea). Rather, are bodies are an essential dimension of who we are. Our bodies and immortal souls are intimately intertwined, which makes us so different from both angels and animals. Therefore death separates what God has joined. So it is natural that we rebel against it and shudder before it. Even the God-man trembled in the Garden. So Jesus confronts death head on, for our sake. The Roman Easter sequence, a traditional poem/song stretching back into the first millennium, highlights the drama: “Mors et vitae duello, conflixere mirando. Dux vitae mortuus regnat vivus.” (“Death and life dueled in a marvelous conflict; the Dead Ruler of Life reigns Alive!”) Gandalf the Grey who sacrificed himself to take out the Balrog, returns as Gandalf the White (Tolkein heard this sung for many Easters before he wrote The Lord of the Rings). “He descended into Hell” of the Apostle’s Creed means that Jesus endured the wrenching of body and soul for our sakes and came out the other side endowed with a new, different, glorified humanity. How does the Bible describe it? Well, Mary Magdalene did not recognize the Risen Christ at first, until He called her by name. The disciples on the road to Emmaus didn’t recognize him either. But doubting Thomas shows us that his wounds were still evident. And though he could pass through locked doors, he proved he was not a ghost by asking for something to eat. Paul describes it as a “spiritual body” in I Corinthians 15, which sounds like an oxymoron to me. But we have to take off our shoes here, realize that we are on holy ground, and that we do not have words adequate to describe the awesome reality of the new humanity he has won for us.